Insurance broker Remi Castaignon entered the final table as a huge chip leader but early on it looked as though things were going to fall apart after a huge hero call went wrong. However, the Frenchman hunkered down and redoubled his efforts, managing to arrest his slide down the chip counts and become only the second Frenchman to win an EPT in Deauville after Lucien Cohen completed the same feat in season 7. After a grueling penultimate day, the players returned to the final table with relatively short stacks leading to setups that no amount of skill would be able to stop. 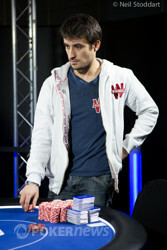 Jeffrey Hakim, one of three Lebanese players to make the final, was eliminated in just the second hand - a victim of a cooler against [Removed:4]. Hakim's exit wasn't the early talking point surprisingly, instead all the attention was on a hand between Castaignon and Rudelitz where the two tangled in an 8 million-chip pot which saw the chip lead change hands after the Frenchman made a huge call on the river. Noel Gaens was the next player out. Short-stacked his tens ran into the aces of the emerging Walid Bou Habib - the latter overtaking Castaignon and moving into second place. Joseph El Khoury followed Gaens out the door in sixth place while Franck Kalfon was eliminated in fifth place barely five minutes later. By this point, Castaignon had recovered his stack from a low point of 3 million and, alongside Rudelitz and Bou Habib, was once again well stacked. Robert Romeo was the lone short stack and fought on manfully, managing to double up several times. 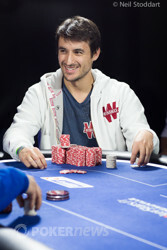 Meanwhile Rudelitz lost several critical pots to both Castaignon and Bou Habib, eventually exiting in fourth position. After this Romeo suffered the same fate as Jeff Hakim at the start of the day running ace-king into aces to bust out in third. Castaignon started the heads up battle with a decent chip lead and gradually began to grind away at Bou Habib, managing to take a 3:1 chip advantage before the crucial hand that decided the fate of the title. The next EPT for the PokerNews Live Reporting Team will be in London next month. Always one of the biggest events of the year, it'll no doubt be another cracker from the capital of the United Kingdom. Walid Bou Habib opened to 325,000, a standard raise but Remi Castaignon made it 1,025,000 in the big blind in a larger than expected three-bet. "He's wanting to play for stacks here," said the commentary team. Bou Habib thought for a couple of minutes, the Lebanese player hasn't ever really tank-folded many hands, if he's thinking about the hand then he's more likely to push his chips in the middle than the cards. Bou Habib then moved all in for 6,285,000 and immediately Castaignon asked for a count. It was about a third of the Frenchman's remaining stack meaning that if he called and lost then the two would be almost exactly level. After a minute more, he quietly said, "Call." A fair few people were surprized to see these two hands but it was still a coin flip. The flop came giving both players a straight draw and now Bou Habib's salvation lied with either a king, eight or seven. The turn was the - a swing and a miss for the short stack and he had just one card left to save his tournament life. The river came down and was flicked over by the dealer, it was the , close but not enough for Bou Habib who'll have to make do with a second place finish worth €475,000. Remi Castaignon raised to 350,000 from the button, Walid Bou Habib called, and the two players saw the first three community cards come . Both checked, then Bou Habib checked again following the turn. Castaignon pushed out a bet of 450,000, and Bou Habib called. The river then brought the and a leading bet of 850,000 from Bou Habib. Castaignon studied the board, the chips and plaques, and then Bou Habib, then made the call. Bou Habib flipped over for the straight, and Castaignon mucked his hand. 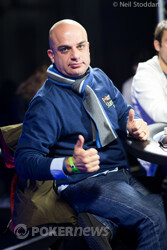 Remi Castaignon raised to 325,000 from the button/small blind but Walid Bou Habib made it 825,000 from the big blind. Castaignon made the call to see a flop of which both players checked. 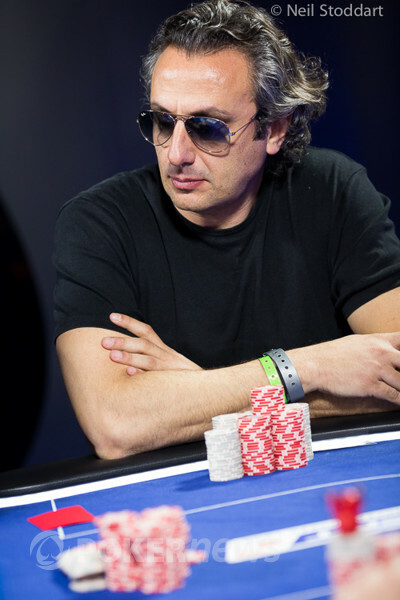 The came on the turn and Bou Habib checked a second time, it was like a red flag to a bull for the Frenchman who bet an interestingly small 400,000. Bou Habib called to see the pair the board on the river before checking a third time. Castaignon reached deep and pulled out several stacks before making a substantial bet of 1.5 million, but this was too much for the Lebanese player who folded again. After Remi Castaignon won that 5 million-plus chip pot off of Walid Bou Habib, the pair took turns raising buttons and claiming blinds and antes for a few hands. Then a hand developed in which Bou Habib raised to 325,000 from the button, then Castaignon interrupted the pattern with a three-bet to 900,000 and after a short pause Bou Habib folded. After that came another hand in which Castaignon raised and Bou Habib called to create a pot of 690,000. 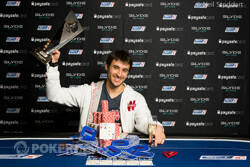 Both checked the flop, then Bou Habib checked-called bets of 525,000 by Castaignon on both the turn and river. Castaignon then showed for jacks and deuces, and Bou Habib mucked. Walid Bou Habib limped on the button for 160,000 before Remi Castaignon bumped the price up to 450,000. Habib gave it a minute before making the call to see a flop. Both players checked to see the on the turn and Castaignon led out for 850,000 this time. Bou Habib made the call and the dealer pushed out the on the river. This time Castaignon bet a substantial 1.5 million, but Bou Habib had no intent of folding and made the call. The Frenchman turned over for two pair and Bou Habib mucked - Castaignon has over a 2:1 chip lead now. They've begun a new level here at the start of heads-up play, with the blinds now up to 80k/160k with a 20k ante. Early action saw Walid Bou Habib raise to 350,000 from the button, and Remi Castaignon slide out the needed plaques and chips to call. The flop came and Castaignon touched the side of his hand to the blue felt to check. Bou Habib then continued for 400,000, and Castaignon called. The turn then brought the and Castaignon checked right away once more. Bou Habib checked behind. The river was the and when Castaignon checked, Bou Habib bet 550,000 and Castaignon called relatively quickly. Bou Habib turned over for sixes and tens, and Castaignon mucked.